Cannon fire splits the air at Governors Island National Monument, and white smoke drifts upward. As startled birds scramble into the sky and a boom echoes off the fort walls, delighted visitors clap enthusiastically for rangers conducting an artillery demonstration on the grounds adjacent to Fort Jay, one of two historic fortifications that define the national monument. Shortly after the United States achieved independence from Great Britain, Fort Jay and its companion, Castle Williams, were built to ensure that New York City's harbor, a center of international trade, would never again fall into enemy hands as it had during the American Revolution. During the War of 1812, in the summer of 1814, while Washington, D.C. was burning and Baltimore's Fort McHenry was being shelled, New York City remained secure. Today, visitors to Governors Island discover a rich history that spans from the arrival of Henry Hudson more than 400 years ago to the end of the Cold War when President Ronald Reagan met with Soviet President Mikhail Gorbachev on the island in 1988. Few historic sites can match the island's long military history, first as an Army post from 1755 to 1966 and later, as a U.S. Coast Guard base until 1996. 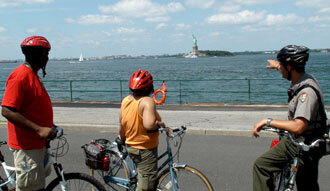 Governors Island is open from Memorial Day weekend through the end of September. On weekends and holiday Mondays the National Park Service and New York City's Trust for Governors Island offer an array of activities designed to engage the whole family. On Wednesdays, Thursdays and Fridays, you can visit the island only by special ranger tours. 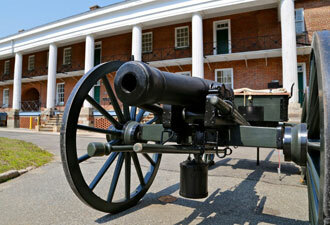 Explore the national monument from the depths of Fort Jay's powder magazines to the parade grounds. Try the rooftop walk of Castle Williams for a sweeping view of the entire harbor rivaling that of the Statue of Liberty. The site invites conversations ranging from New York history to engineering to military strategy. As you walk around Fort Jay, you get a glimpse of what life might have been for the soldiers who lived and worked in this star-shaped fortification that barely rises from the hill it was built on. You'll discover that setting the fort low to the ground was a particularly useful military technique in “target shrinking” when teamed with the expansive dry moat that surrounds it. Head over to Castle Williams to pick up a ticket for a ranger-led tour of the castle. The tour takes you through the structure's history, from its beginnings as a radical alternative to the traditional star-shaped fort, to its use as a military prison from the Civil War to the Cold War. Castle Clinton even served as a community center during the island's time as a Coast Guard base in the 1960s and '70s. Perhaps the most colorful period in Governors Island's history is the Civil War, when the island served as an arsenal and troops from both the North and the South resided there— Confederates as prisoners of war and Yankees as new recruits on their way to the front. Now, as the nation observes the 150th anniversary of the conflict that divided the country, is a particularly memorable time to take part in the park's annual Civil War Weekend. This weekend encampment normally takes place each August and brings dozens of re-enactors to the island to demonstrate what life was like for Confederate prisoners, camp followers and Union officers. You can see how they washed clothes by hand, learn about their nearly inedible—and indestructible—foodstuffs, and peer inside tents sheltering soldiers' meager belongings. You can gain some insight into New York City's July 1863 draft riot, when hundreds of city residents died and which ended only after a commanding presence of battle-weary troops returned from Gettysburg to restore order. 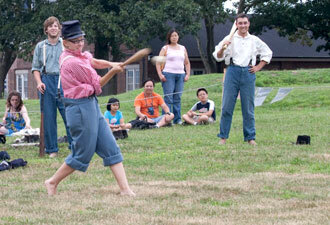 You can even cheer on a Civil War-era baseball game, a pastime that had just been invented. As a 34-star Star-Spangled Banner flag waves over Fort Jay during the event, a carefully drilled contingent of rangers present canon and black powder rifle-firing demonstrations. It's a thrilling experience for anyone who takes the eight-minute boat ride from the tip of Manhattan to Governors Island. Join us on the firing line!